Fibromyalgia doesn’t exist! It’s a figment of your imagination! Get over it! Get outta bed and get a job! Excercise. Deal with your so called “pain“. Stop being depressed! Stop being sad right now! Be happy and pain free immediately you faker! This is what insurance companies would love to tell all claimants who have used Fibromyalgia as the primary reason for their inability to return to work, or pursue any form of gainful employment. Some doctors, particularly those old school doctors would tend to agree. Other doctors, and this Toronto Personal Injury Lawyer would adamantly disagree. Fibromyalgia is real. Fibromyalgia is debilitating. Fibromyalgia is not a figment of your imagination. Our personal injury law firm has helped countless Fibromyalgia sufferers with their denied short and long term disability claims. Firbromyalgia is not like breaking a bone. It doesn’t show up on any sort of x-ray or scan. Doctors (rheumatologists in particular) tend to find it by pressing on 18 of the body’s trigger points for the illness. 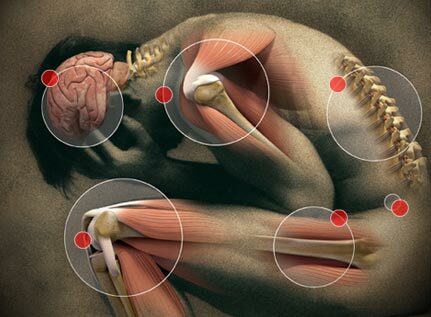 The more sensitive trigger points, the greater chance of the diagnosis of Fibromyalgia. But because Fibromyalgia is not seen on any sort of x-ray report or scan, and for other complicated medical reasons which are best left to Rheumatologists, there are two schools of thought when it comes to Fibromyalgia. Some think it’s very real. Others deny its existence entirely, or deny that it could prevent a person from performing their own, or any sort of gainful occupation. The American College of Rheumatology estimates that 3-6 million Americans live with Fibromyalgia. After arthritis, firbromyagia is the #2 biggest ailment impairing the muskuloskeletal system. Around 90% of the population living with Fibromyalgia are women, but men have been known to develop it too. It’s mostly seen in women between the ages of 21-51. People with Fibromyalgia are 3-5 times at greater risk to develop depression or depressive symptoms. 89% of Fibromyagia sufferers develop pain in their jaw (TMJ). Another 51% (if not greater) have to deal with nearly constant throbbing headaches. Around 31-41% of the people who have been diagnosed with Fibromyalgia are NOT able to keep their jobs, or find to find alternative employment. Half of those people need assistance or cannot perform their activities of daily living. Fibromylagia sufferers are hospitalized around once every 3 years! I can vouch for that stat. I’ve seen it time and time again, both at home and with my clients. All stats are courtesy of the American College of Rheumatology and the Centre for Disease Control and Prevention. So. What is Firbromyagia? It’s defined loosely as a common syndrome which affects the body’s muscle, tendons, and other soft tissue to create pain and tenderness. It’s long lasting and has been linked to headaches, fatigue, depression, anxiety and sleep problems. It’s not contangious. What brings it on? I’m not sure exactly, but some might argue trauma, or just bad luck. People suffering from Fybromyalgia have symptoms including but not limited to, generalized pain, headaches, sleep disturbances, achiness, depression, anxiety, stiffness, low energy, moodiness, fatigue, loss of concentration, shortness of breath, sadness, depair, numbness, tingling sensations, and other really bad things I wouldn’t with upon anybody. Think chronic pain, but not really chronic pain. Again, some insurance companies, doctors and others in the general public don’t believe that Fibromyagia exists. If it doesn’t exist, then why in 2007 did the FDA approve the sale of Lyrica (Pregbalin) specifically for the treatment of Fibromyalgia? And then in 2008, the FDA recognized Cymbalta as a drug speficically for the treatment of Fibromyalgia. Canada also picked up where the FDA left off and has recognized that both drugs are legitimate in the treatment of Fibromyalgia. So if our drug agencies are approving the sale and distribution of medication for the treatment of Fibromyalgia, how can doctors or insurers argue that Fibromyalgia doesn’t exist or isn’t a legitmate disorder. Clearly it’s legitimate enough to require federally appointed drug agencies both in Canada and the United States to approve the sale and distribution of such drugs. If the need didn’t exist; If the syndrome was a hoax; Then the drugs wouldn’t be sold to remedy same!!! Ok. I think I’ve made my point. Goldfinger Injury Lawyers has helped countless long term disabilty claimants recover benefits from insurance companies such as Manulife, Great West Life, Desjardins, SunLife, Standard Life, SSQ, Canada Life, Equitable Life, RBC Insurance, BMO Insurance, Manufacturers Life Insurance and others. It’s not unusual for most insurance companies our law firm has dealt with, if not all, to question the legitimacy of a Fibromyalgia sufferer’s long term disability claim. Don’t get down. Don’t get frustrated. This is how these sort of claims work, and with the knowledge from a knowledgeable personal injury lawyer, you will get the results which you deserve. All of these cases are marathons. They aren’t sprints. If our Toronto law firm could get you a million dollars tomorrow, we certainly would. But, this isn’t how long term disability litigation works. Insurance companies don’t get rich by paying out every claim they see right away. If they did, they wouldn’t make any money and their share holders wouldn’t be happy. Long Term Disability Insurance companies like to test the waters first, and drag the case along as slowly as possible. They want to catch you doing something detrimental to your case. Think waterskiing, sky diving or bunji jumping. The longer they make you wait, the more desperate you will get and the greater the chance you will do something stupid to destroy your claim. They think you may magically heal and return to work all of the sudden, which would limit your claim. They think you might die all of the sudden which would also limit your claim. Again, the longer they wait, the longer they get to hold on to their money and the greater the chance that your case falters. The best advice I have for my long term disability Fibromyagia clients is to stay calm and focus on your wellness and rehabilitation. Let us take care of the rest. That’s what we’re here for.